Jamie Hyneman and Adam Savage are champions of science and technology, who worked on special effects for seminal Hollywood films before teaming up ten years ago to educate and entertain millions of viewers around the world. Through the course of his 25 years of work in the effects industry, Jamie has had his hand in producing effects for over 800 commercials, dozens of feature films, and has built hundreds of prototypes. Adam has multiple hobbies and is passionate about restoring his vintage four-wheel drive vehicle, and researching and accruing new pieces for his movie prop collection. When not shooting shows or working on pet projects, Adam and Jamie travel the country to corporate events, museums, and colleges, for groups as small as 20 and as large as 20,000, telling tales of experiments, explosions, and hijinks. Tested is their home on the web. 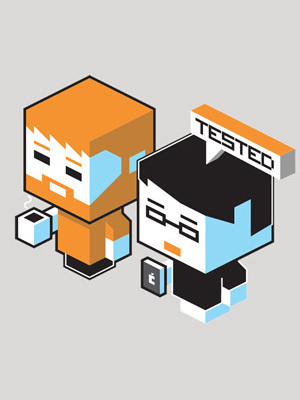 Will Smith and Norman Chan launched Tested in 2010 as a place to share their interests and passions with the world. Will works to master many coffee brewing techniques, is learning novel and traditional cooking styles, and keeps trying to expand his dog’s vocabulary beyond 150 words. Norm loves learning new photography tricks, is fascinated by comic book and cosplay culture, and is still on the hunt for the perfect pair of headphones. Both Will and Norm are unabashed adult fans of LEGO. As the curators and producers of everyday stories and video on Tested, trust Will and Norm to bring the off-beat enthusiasm and pragmatic coverage that long-time Tested readers have come to expect, infused with Jamie and Adam’s sensibilities and hallmark inquisitiveness. SO, WHAT KIND OF STUFF CAN I READ ABOUT ON TESTED? The short, pithy answer is: We'll cover anything that's awesome. The longer answer is that we have many interests, ranging from breakthroughs in science, amazing tales of exploration, and discoveries in nature to emerging technologies and new consumer products that promise to change our everyday lives. Tested is the place where we’ll explore those topics in depth, asking the hows and the whys about the things that excite us the most. The number one rule of Tested is simple. We want to make Tested the site that we'd be most interested in reading. If you think there's something we should be covering, but aren't, please let us know! I WANT YOU TO TEST SOMETHING SPECIFIC! If you make stuff and would like us to test your product, send us an email describing the product. Let us know exactly what it does, who it's for, and why you think we'd be interested. If you have an idea for a project that you’d like us to build or test, send a pitch over! We’re always eager to hear interesting geeky stories, learn about makers’ projects, and find new places to visit. Drop us a line and share your stories at tips@tested.com. WANT TO SEND SOMETHING TO THE SITE? Yes, yes we are. Here's our Twitter feed and here's our Facebook page. You can also follow Jamie, Adam, Will, and Norm on their respective Twitter pages.